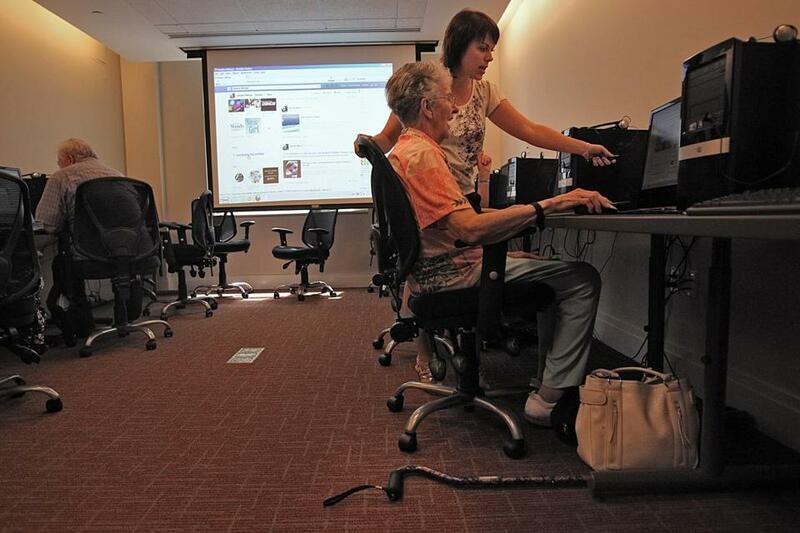 Mary McCluskey, 89, a former secretary, gets some help navigating Facebook from Natalie Billings, in a class at Jewish Community Housing for the Elderly in Brighton. They adjust their reading glasses to make out the letters on the screen. They type with one finger. They have their user names and passwords written down on paper. They want to know what the “status update” is for. Indeed, most students in Billings’s Facebook class at the Jewish Community Housing for the Elderly in Brighton are old enough to have great-grandchildren. Billings began teaching the course in May, after the seniors expressed a desire to learn about Facebook on a JCHE survey. So she created large-print handouts with simple instructions and started helping the residents set up profiles and look for friends. I recently received a friend request from someone I’ve known and loved all my life, but never expected to tag in a photo: my 84-year-old grandfather. Facebook student Zoya Melnikova, 77, wants to use the site to stay in touch with old classmates and family in Russia, Ukraine, Canada, Germany, and Israel. But, she admits, she has a hard time logging in because she forgets her password a lot. At JCHE, an organization that offers housing for close to 1,500 older adults (generally, at least 62 years old), the Facebook class has recently been offered in English, Russian, and Chinese in Brighton, Newton, and Framingham. A new computer lab opened two years ago. The JCHE also launched its own Facebook page, and is trying to encourage seniors to click on the “like” button, which will sign them up for updates about JCHE though Facebook. The City of Boston Elderly Commission launched its first Facebook page this summer and plans to conduct training sessions on how to use Facebook and social media in general in October and November, said commission spokeswoman Tula Mahl. The Leventhal-Sidman Jewish Community Center in Newton is also teaching elders about technology. Last fall, workshops introduced students between the ages of 76 and 92 to iPads and iPhones, said senior adult program manager Cynthia Katzeff. “They are bored and they want to continue [learning.] They have the time now,” Katzeff said. While seniors are still less likely to use Facebook than younger people, they are increasingly signing up for the social networking site, said Mary Madden, a senior researcher at the Pew Research Center’s Internet & American Life Project. According to the center’s latest report, released in February, 34 percent of people over 65 are now on Facebook, up from 28 percent in 2010. The percent of older adults who use the Internet is also going up: Pew estimates that 56 percent of people at least 65 are active online, up from 47 percent in 2010. Madden said retirees use Facebook to keep in touch with their grandchildren, reconnect with old friends, and even network with other people who are suffering from similar chronic diseases. Some researchers, such as Shyam Sundar at Pennsylvania State University, are studying the mental and physical benefits of social networking for older users, especially for those whose mobility is restricted or who live in remote rural areas. He noted that some older people are not interested in Facebook because they are concerned about the lack of privacy, or because they find virtual communication superficial and time-consuming. Even if they create a profile, they often don’t have many friends and log in only rarely, such as once a month, he said. To encourage more elders to give social networking a try, a group of researchers from the United Kingdom are studying how to make Facebook more senior-friendly with large fonts, Sunbar said, while there are a number of social-networking sites aimed at older users. Back in Brighton on a recent Thursday afternoon, Facebook class attendees seemed motivated and asked questions as they gazed at a large screen on which Billings projected her own Facebook profile as an example. As she talked, some class members tried to send messages to each other and peeked at their neighbors’ computers to see if the message came through. For most, writing each virtual communication took a while; retired secretary Mary McCluskey, 89, seemed to be the only one with good typing skills. She said she wants to master social networking to stay in touch with her nieces and nephews, who live all over the country and don’t always answer their phones. Computer class isn’t going to get less complicated any time soon. Next on the schedule is a class on Twitter. Billings is preparing the materials for it now. Julie Masis can be reached at greenelephant888@gmail.com..